William H. Murdoch may have retired to Nova Scotia, but his son, Jack, is a detective on the Toronto force in 1936 when he meets Charlotte Frayne, a private investigator on her first case. 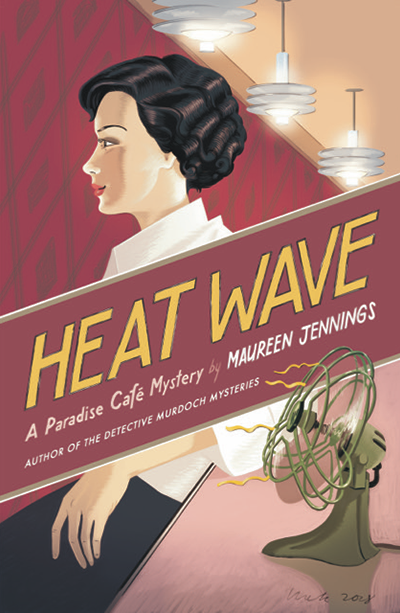 In Heat Wave, the first book in the Paradise Café series, Charlotte meets Jack Murdoch, when she arrives at her employer’s home, called there because there has been a break-in, vandalism, and his wife has been attacked. Her employer, T. Gilmore, had left the office earlier that day because he’d received anti-Semitic hate mail. Charlotte’s first job is at the Paradise Café, which is owned by four veterans of the First World War. These men were all prisoners of war. Upon their return to Toronto, they have set up the café together. Soon after starting her investigation into what appears to be a systematic robbing of the till, one of the owners, Conal Pierce, is found dead in his rooming house. The police conclude that Pierce has taken a lethal dose of the drugs he’s been using to deal with the lasting physical and psychological effects of the traumas he suffered in the war. It turns out that these two events, seemingly unrelated, are very much related. Maureen Jennings is the author of the beloved Murdoch mystery books, which have sold hundreds of thousands of copies in Canada, the U.S., and the U.K. The first books in the series were made into films for television. Soon after, Murdoch Mysteries began in 2008 and is still running today. In addition to the Murdoch mysteries, she has published, five of which have been nominated for the Arthur Ellis Award. Her books have also been nominated for the Anthony Historical Mystery Award, the Macavity/Sue Feder Historical Mystery Award, the Barry Award, and the Bruce Alexander Award. She received the Heritage Toronto Certificate of Commendation. Maureen has also published two Christine Morris books, Does Your Mother Know? and The K Handshape, which was nominated for the Arthur Ellis Award. She has also published three Tom Tyler books, Season of Darkness, Beware This Boy, and No Known Grave.